The original model T-KJr was released in 2003 as the smallest unit from Takagi water heaters. In 2010 two new T-KJr2 models have been introduced, and the users can choose between an indoor and outdoor model. Both models are tankless and non-condensing, powered by natural or propane gas and come with the reduced gas emission. Looking at the online stores, such as Amazon.com, Takagi T-KJr2 is the most popular series from this manufacturer, with over 90% of positive reviews (2018). All T-KJr2 models are designed for domestic hot water heating, delivering hot water on-demand and in endless supply, and due to its lower gas input and water flow rate, are recommended for smaller homes, apartments, condos, cottages, and households with up to two bathrooms (in warmer areas) or just one in colder regions. The number of showers these units can handle actually depends on the temperature of the incoming ground temperature. These models are not designed only for water heating, but for recirculation systems, radiant floor, and baseboard systems in space heating and can be used with conventional water tank systems. The small and compact size of approximately 14"x22"x8" allows easy wall installation saving the floor space for other use. 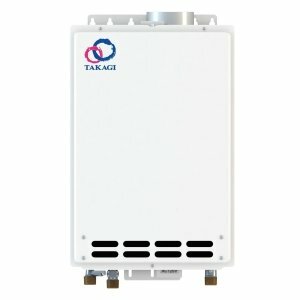 Takagi T-KJr2-IN is an indoor model that can be converted to a direct vent unit with the sealed combustion, and installed in rooms with a limited amount of fresh air (confined spaces). With the direct vent conversion kit, T-KJr2 can be installed in mobile and manufactured homes too. The venting system on T-KJr2-IN utilize the 4" stainless steel pipe and based on the installation options it can be terminated horizontally or vertically, providing more flexibility during installation. The intake pipe can use smaller and cheaper PVC pipe. T-KJr2-OS is an outdoor model (it cannot be installed indoor) and it does not require venting – it is ventless. The gas burner has the potential to provide up to 140,000 BTU of power, producing a maximum of 6.6 GPM of hot water, which is sufficient for one to two fixtures, operating simultaneously. The units use the standard ¾” water connections. The remote controller is the standard feature and it allows you to set one of 16 temperature settings, between 99 F and 167 F.
Another advantage of having the remote controller is an easy troubleshooting. Thanks to the electronic circuit board, T-KJr2 water heaters are self-diagnostic, so if anything goes wrong with the unit, the diagnostic error codes, such as 03, 11, 70, 71... will display. The water heater works in the range from its minimum of 19,500 BTU to its maximum power of 140,000 BTU, thanks to its fully modulating burner. The electric circuit board adjusts, based on the inputs, the power on the burner and water valves, while monitoring the incoming and outgoing temperature. This way, you are getting the right amount of hot water at the right temperature, with less fluctuation and reduced energy consumption. As opposed to more advanced non-condensing units, this product cannot be combined in the multi-link systems. To start the heating process, the water heater does not use the old pilot light ignition but the advanced electronic ignition system that automatically lights the burner. The flame rod is there just to inform the electric board if there are any issues with the burner flame. Gas and water connections - 3/4"
By looking at the reviews, you will see that over 70% of the comments are marked with 5, while in total over 90% are positive. When it comes to the quality, it is sufficient to mention one of the comments, where the user decided to install the unit by himself knowing that he will lose the warranty, because he was assured that Takagi T-KJr2 is “rock solid and easy to maintain”. The installation could be hard if you don’t have basic skills and knowledge about plumbing, electricity, and gas. But if you are a handyman, use the service valve kit and flexible gas and water lines, the installation becomes straightforward. The manual should be read carefully and consider all the factors for easy installation; altitude and dip switch installation, venting length (stainless steel), condensate trap, flexible connections, shut off valve and other. Be aware that if you need hot water at the low pressure (low flow), the unit won’t turn on, because the minimum water flow requirement was not met. According to the users who have hard water and to avoid problems, a filter and water softener must be installed. Small size and capability to heat potable water efficiently, combined with the space heating and recirculation, is what makes Takagi T-KJr2 models a good buy. And with the endless hot water, energy conservation, and affordable price, T-KJr2 gets more attractive.